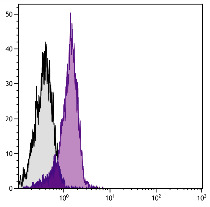 The CD45 antigen is an essential regulator of leukocyte activation and development and is now known to be a protein tyrosine phosphatase, e.g., CD45 is able to dephosporylate the Src family of protein kinases. 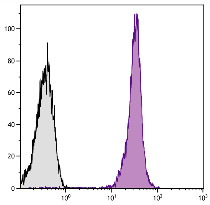 This activity is known to be required for signal transduction induced by T and B cell antigen receptor engagement, cytokine signaling, and Fc receptor stimulation. 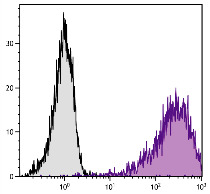 The functional state of CD45 also has a pronounced effect on lymphocyte development. 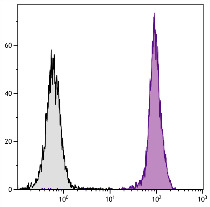 CD45 exists in multiple forms, such as the restricted variants (CD45R; see companion products 1660, 1665, 1675, 1685 and 1820) and as allelic forms CD45.1 (Ly-5.1) and CD45.2 (Ly-5.2). 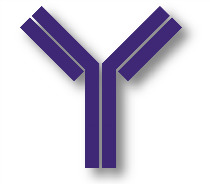 The specificity of antibodies to CD45.1 and CD45.2 has been exploited in studies where resolution of donor and recipient cells is essential, such as in gene therapy or bone marrow transplantation. 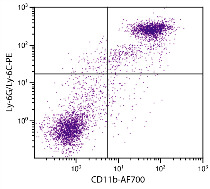 The monoclonal antibody 104 recognizes CD45 (leukocyte common antigen) on all leukocytes of mouse strains expressing the CD45.2 allotype (e.g., A, AKR, BALB/c, CBA/Ca, CBA/J, C3H/He, C57BL, C57BR, C57L, C58, DBA/1, DBA/2, NZB, SWR, 129). BALB/c mouse splenocytes were stained with Mouse Anti-Mouse CD45.2-PACBLU (SB Cat. No. 1800-26).